If you want room to breathe, to create, to pause, to dream, to spend time with people you love, or to know who you are and what matters to you, stop filling all the spaces. As we declutter and let go of stuff, busyness, mind spinning and heartache, things may feel empty at first. And empty can hurt. So we fill the spaces to relieve the pain. Then we start all over again. When you move into a new home or if you recently decluttered your home, don’t rush out and buy all the things each room is supposed to have. Live in the space and then decide what you want or need. It’s up to you, and it’s much less than anyone will have you believe. Stop filling all the spaces with the right stuff. After a break-up or break-down, be willing to feel the emptiness and wait for the lessons. 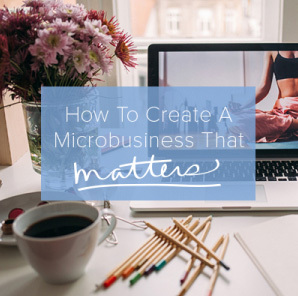 Stop filling all the spaces with busyness, shopping, food, booze or other numbing devices. They won’t prevent the pain, only delay it. When you declutter your closet, empty hangers are not a shopping invitation. 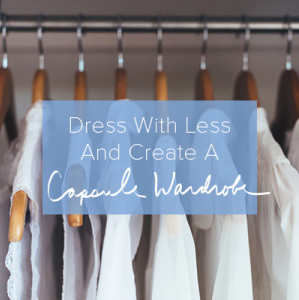 Dress with less and decide what “enough” means to you. Stop filling all the spaces with clothing that doesn’t fit your body or your lifestyle. If there is extra time while you are waiting in line, sitting in traffic or simply settling in after a long day, take a few deep breaths and reflect. Stop filling all the spaces with digital distractions and mindless scrolling. When an appointment cancels, or something falls off your to-do list, don’t replace it. Embrace the margin. 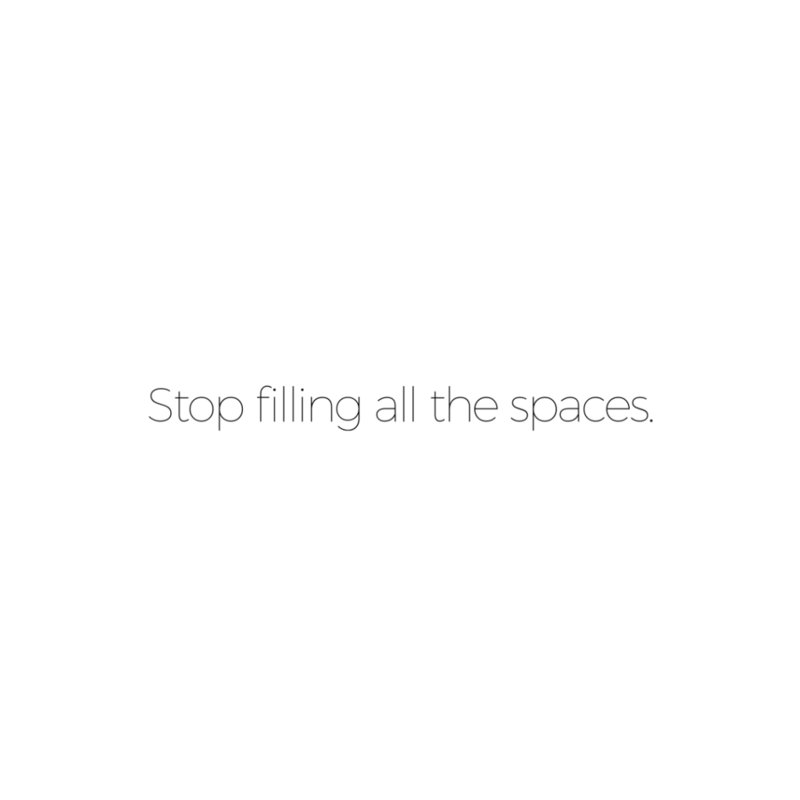 Stop filling all the spaces with more to do. Less do. More be. Stop filling all the spaces. Instead, let the extra spaces in your home and on your calendar and in your mind or heart be empty for awhile. The emptiness may be uncomfortable at first, but that’s where the answers lie. And when it’s time, you’ll have room for what you really want. Nice blog! Really love you insights. This is so true. I always do that, fill spaces with busyness. You’re right, you got to embraces the free time! Great thoughts Courtney! A friend of mine just posted her quote: “The greatest moments in my day occur when I disconnect from my phone and I am left to my own devices.” Nice synergy with your prompt to watch for our “numbing devices”–‘love it when the day creates it’s own theme! Hi Courtney, just a great timely article as usual! I am currently going through much of what you wrote about and really needed to hear this today! And to Melinda, I really related to your comment (your friends’s post/quote). When I read the quote l immediately thought, “ when I am left WITHOUT my own devices” – Hahaha No phone, iPad, laptop, Kindle, etc. – all of these are useful and indeed quite wonderful, but it CAN get overwhelming! I consider myself an introvert, as well as a highly sensitive person – I need to disconnect in order to think!! I’m probably not alone in feeling this way. The world is too much with us, it seems… anyways, thanks to both of you for lovely insights (from a long -time faithful reader). …and similar to the thought of “without” devices I’ve been pondering that if I disconnect, I hope I can still FIND my own devices–the devices of being quiet, reading, taking a walk (without a podcast! ), etc. 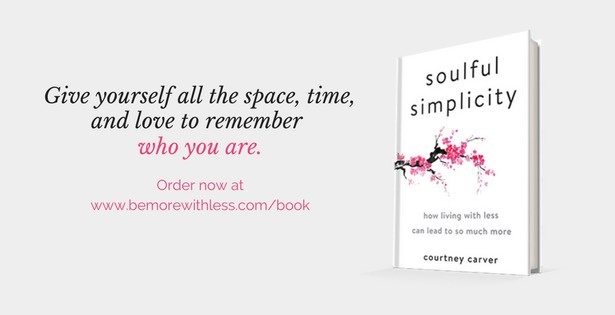 But, Courtney has a great list of taking deep breaths and not filling the spaces–something important for us who are introverts. I’ve enjoyed everyone’s thoughts here. I love to clear the surfaces in my home. When I see piles of papers or stuff, it robs me of my mental clarity and zaps my energy. I love to declutter. I find it empowering and uplifting. My problem is that I’m the only one in my family that feels that way. I relate to all of this. It’s a bit of a puzzle when you feel this way but share space with others who aren’t the same as you in this way. I love that thought of don’t fill in the spaces! I am in process of decluttering and their are some white spaces beginning to open up. I cleaned off my countertop in the bathroom and have not filled it up again. It is going in the bottom cabinet. Put the grandkids toys under a desk instead of out in the room. Cleaning the kitchen table off which is a landing spot. So I really love to be reminded NOT to fill in those spaces. Thanks Courtney! I have just “downsized” after ~30 years in the same house, and I took the plunge to declutter, taking my time to sort through things before I packed them up, and taking the rest directly to the recycling centre. I am now in my one-bedroom flat with 2 chairs and my computer table plus bed, wardrobe and no other furniture. I will spend some time deciding what items of furniture to add to my living room before making the plunge. It wasn’t what I was going to do, as I was already looking at couches,sofas,chairs etc. but I find wisdom in your words about taking time to get what suits you, not what is “usual”. Many thanks for your writings. So true, such a process (not an event) for me. I started in 2004, with the motto, ‘less is more’ (from FLYlady). I began decluttering. Now 4 moves later I crave less but am having trouble letting go of some material things and even more—pictures. I’m in the middle of shedding pounds so I’m discarding clothes by the bagful trying to not buy more than essentials till I achieve my personal goal. I appreciate your journey and especially your sharing how to show us to find courage to find our own happy, stress-LESS place. God bless you. I just joined after reading an article about purging old journals. I’m moving soon and I’m tired of lugging almost 30 years worth of journals with me. I never look at them. I feel like I want to let them go, but at the same time, I’m really afraid. Like I’m throwing away part of myself that I can never find again. Any words or advice to make it easier?? Who has done this and regretted? Or not? I’m torn on this one. I also have a lot of old journals that I never read. I have mixed feelings about getting rid of them. About a decade before my grandmother passed away she started shredding her old journals. She got rid of everything she wrote. I was very close to her and would have loved to read some of her writing. Obviously this is not what she wanted and I understand that. But it does make me think twice if I want to keep some of my own for my daughter to read one day. About 8 years ago I finally shredded a bunch of journals that I’d written in my 20s. Full of angst and navel gazing. I’d begun to wonder, what I’d i died tomorrow, THIS is how people would see my inner life. Definitely not the legacy I’d like to leave. It was so liberating to shred them and let them go. I highly recommend it 🙂 After all, they’d served their purpose – allowing me to process things. They weren’t required for reference; rereading just stirred up old emotions and hindered moving on. Thank you so much! I had just successfully eliminated several time-consuming commitments (stuff is not really my problem anymore) and was thinking about taking on something new when you posted this article. So I stepped back and decided to enjoy my new freedom instead of starting another project, as worthwhile as it may seem. Great advice. It’s important to resist the urge to go out and buy a whole bunch of new stuff to replace all the old stuff that just left. I’ve found that also discarding unused plastic storage containers and hangers helps prevent more clutter from entering the house.